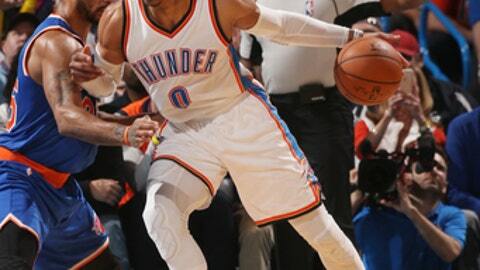 OKLAHOMA CITY (AP) Russell Westbrook closed out the first half in familiar fashion – with a triple-double and a win. Westbrook scored 38 points and posted his 27th triple-double of the season to help the Oklahoma City Thunder beat the New York Knicks 116-105 on Wednesday night. Westbrook enjoyed heading into the All-Star break on a good note. ”You want to have a good feeling, good taste in your mouth going into the break, and then make sure you come back ready to play,” he said. Anthony had 30 points for the Knicks after being selected to the All-Star Game as an injury replacement for Cleveland’s Kevin Love earlier in the night. Derrick Rose scored 25 and Courtney Lee added 16. New York led by 17 in the second before the Thunder rallied and took a 62-60 lead at halftime. Westbrook had 19 points and 10 assists at the break. Anthony hit just four of his final 13 shots. Westbrook credited Andre Roberson for sticking with Anthony after the rough start. Thunder: G Alex Abrines was added to the Rising Stars Challenge as a replacement for injured Philadelphia big man Joel Embiid. Abrines joins Thunder forward Domantas Sabonis on the World Team. … Thunder owner Clay Bennett presented Westbrook with his All-Star Game jersey before the opening tip. The Knicks shot 56 percent in the first half and still trailed, then dropped off to 40 percent in the second half. Former Thunder center Kendrick Perkins attended the game and got a standing ovation from the crowd. The enforcer from the team’s trip to the 2012 NBA Finals visited the locker room after the game. He attended practice earlier in the day. Knicks: At the Cleveland Cavaliers on Feb. 23. Thunder: At the Los Angeles Lakers on Feb. 24.